Bill Schuette (L) and Jill Stein. 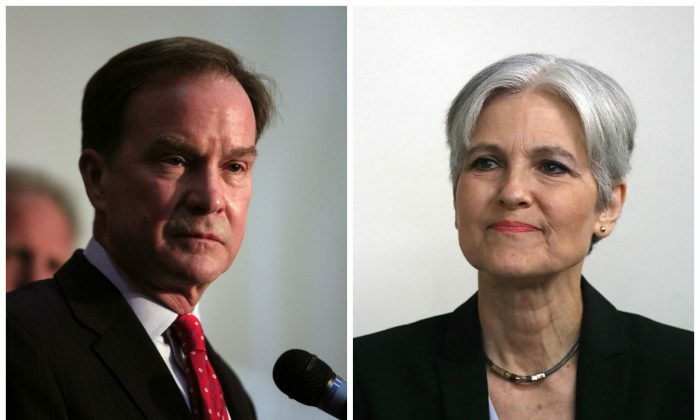 Attorney General Bill Schuette argued that Green Party candidate Jill Stein cannot seek the recount because she was not “aggrieved” to the point at which a potential miscounting of votes could have cost her the election. Stein only received about 1 percent of Michigan’s vote. The filing Friday delayed the start of a state election board meeting to consider Trump’s request to block the hand recount of all 4.8 million ballots cast in Michigan. Trump defeated Democrat Hillary Clinton in Michigan by 10,700 votes. A recount is already underway in Wisconsin and Stein is pushing for a statewide recount in Pennsylvania. Both states were considered crucial battleground states, which Trump won. “Jill Stein received fewer than 52,000 of the more than 4.7 million votes cast in Michigan’s election for President, yet she now alleges that she is an ‘aggrieved’ candidate and demands a recount that has no possibility of changing the result of that election,” the lawsuit stated. Clinton’s team announced they would be joining in the recount efforts last weekend. As of Friday afternoon, his motion is still pending.